In the face of mounting deaths and daily news stories about distracted drivers striking pedestrians, Americans continue to cling to their iPhones and steering wheels simultaneously. Our streets and highways are littered with bodies from cars whose drivers were too distracted to focus. The continued effect of driving while distracted (DWD) is a body count that increases each year and which is probably grossly understated at 424,000 Americans injured each year from DWD. Perhaps because there are over 153 billion text messages sent each month in this country, or the fact that at any moment 660,000 drivers are using their phone or electronic device while driving, or the fact that each new generation of cars has more and more electronics (some are now equipped with Wi-Fi! ), the problem of distracted driving is only getting worse. Americans are habituated (“addicted”) to glancing at their phones when it rings or vibrates. This happens even when we are driving. Like Pavlovian-mammals at the wheel, we cannot resist the temptation to look and respond. And many who believe that hands-free cell use is the answer are wrong. This results in a phenomenon known as inattention blindness, which is a psychological lack of attention. It is an inability to perceive something that is within a driver’s visual field. Texting while driving, recognized by most everyone as hazardous, continues. Sending a text message while operating a car causes the driver to take their eyes off the road for an average of 5 seconds. At 55 mph that’s the equivalent of driving the length of a football field blindfolded. Experts have concluded that all the technology in the world will not solve this problem unless the user wants to. The commissioner of the California Highway Patrol had a suggestion that should be strongly considered: Think of driving as we do flying, and have a set period of travel time that is free from calls, texts and emails. 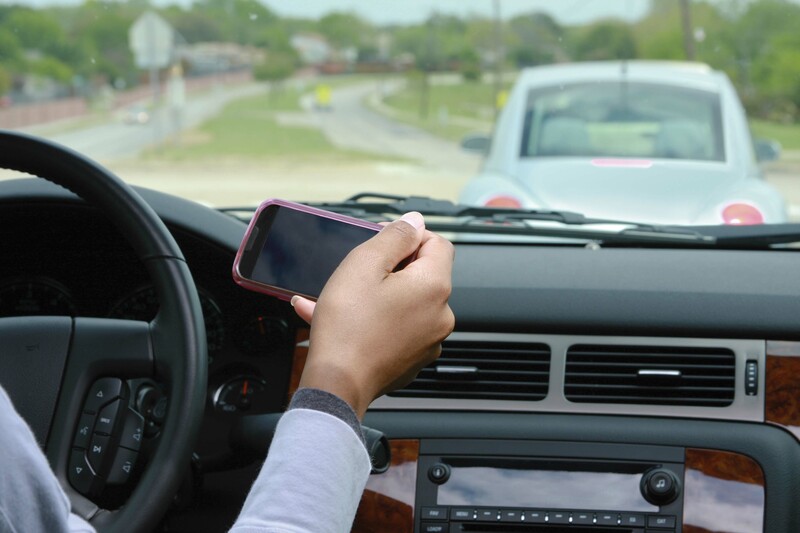 Most experts feel that eliminating cell phone distraction requires regulation, education and enforcement, much like getting the public to use seat belts. One aspect of the solution is technology. There are hardware and software solutions that can be applied to help inhibit distracted driving. Some work with cellular phones where a controller installed in a car wirelessly notifies phone service carrier networks once the car begins to move faster than five miles per hour, interrupting texting and other social media updates (as programmed by the phone subscriber) to the phone. AT&T has a somewhat similar app-based system called DriveMode, thought DriveMode kicks in at 15 mph and can be turned off (though it can also notify parents, for example, if teen users disable the app). There are things like iSpeech apps that read text messages aloud for drivers while on the road. Of course that does not solve the inattention blindness problem. There is an app called iZup that sends calls to voicemail and text and data until user is no longer in transit. But in reality most apps are voluntary or can be defeated. Until vehicles are manufactured that block all cellular and Internet activity while a car is in motion without capability of defeat, these technologic fixes are inadequate. Attempts to curb texting and driving by social pressure thus far have been unsuccessful. The “need” to stay connected to social media, talk to friends or answer work-related calls has proved too strong. Thus the requirement for stronger tools. The criminal and civil justice system must be employed to create strong disincentives for such behavior. To do so requires legislative and judicial action. In order to effectively curb the DWD problem, the justice system must act swiftly. It was bad enough that Florida was among the last major states to ban texting while driving (2013), yet the statute still only makes it a secondary violation (the police must have another reason as the primary basis for pulling over the driver). (5) (b) A violation which causes or contributes to a collision with a vehicle or person resulting in death shall be a third degree felony. (6) A finding of violation of this section shall be prima facie evidence of negligence in a civil action. Next there must be a statutory right to punitive damages for DWD. This only makes sense since distracted driving makes a driver as inattentive as one who is intoxicated (and worse in many studies) and is always voluntary in nature. The purpose behind punitive damages is and always has been to punish and deter. Similarly the only way to eliminate the highly dangerous behavior of texting while driving may be to criminalize it and provide for civil punitive damages to deter others. Sections 768.725 and 768.73 do not apply to any defendant who, at the time of the act or omission for which punitive damages are sought, violated Florida Statutes 316.305 (“Florida Ban on Texting While Driving Law”). Any person who is found by a preponderance of the evidence to have been committing a violation of 316.305 shall be subject to punitive damages. Although it may be naïve to believe that reforming these laws will bring about immediate social change which has been previously impossible, it is seemingly the last best chance. To fail to act leaves the status quo: thousands dead and almost half a million Americans injured. All because the text couldn’t wait.